In 1899 Glazunov acceded to the professorship of composition and orchestration at the St Petersburg Conservatoire, becoming Director in 1905. He was destined to leave the Soviet Union in 1928, somehow managing to retain titular office at St Petersburg for a further two years. By this time the pressures of an onerous position and the privations of both world and civil war had taken their toll; hence the tragicomic dimension in the memoirs of Shostakovich, who could remember him late on in the older man’s career. 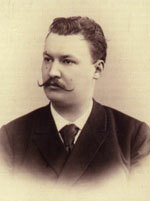 A bachelor for much of his life, Glazunov had lived for many years with his mother, whose protective instincts were so powerful that Rimsky-Korsakov was able to recall her admonishing a maid over ‘the child’s linen’; the Director of the St Petersburg Conservatoire was seemingly past forty at the time. In view of the difficulties of such a ménage, and of material hardships which caused the Glazunovs to inhabit only two rooms of their large apartment, it is perhaps not surprising that alcohol played a significant part in the composer’s life. Having discovered that Shostakovich senior could procure neat alcohol for him from state reserves, Glazunov is recalled by his student protégé exercising all his powers of persuasion at a time when vodka was not to be had. The above is arguably relevant to an appraisal of Glazunov’s compositional productivity in that it would seem to throw no less light than administrative distractions upon an extreme decline in output after 1906. It is a curious fact that the composer’s symphonic output was by then complete, with the solitary exception of a slow movement (1910; orchestrated by Yudin) which is all that exists, in any definitive form, of a planned ninth symphony. All the eight complete symphonies therefore predate the celebrated Symphony No 2 of Rachmaninov and may thus be seen the more clearly as an extension of an earlier chapter in the growth of the Russian symphony as a whole. The reasons for such an identification require closer scrutiny and also some qualification. As has been indicated, Glazunov’s early career brought him into amicable proximity with at least three of the proponents of Russian nationalism via the Belaieff Circle. 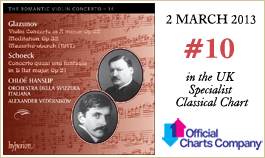 By that time, however, the so-called Kuchka or ‘Mighty Handful’ (also known simply as ‘The Five’, and consisting of Balakirev, Borodin, Cui, Mussorgsky and Rimsky-Korsakov) had largely had its day: ‘But who were we in the eighties? In the sixties and seventies we were Balakirev’s circle, at first under his absolute leadership, later little by little casting off the yoke of his absolutism and gaining greater independence … Our circle of the eighties, especially … the latter half of that decade, was no longer Balakirev’s, but Belaieff’s’ [Rimsky Korsakov: ibid.]. A native streak of paranoia in Balakirev’s make-up ensured mutual alienation thereafter. Mussorgsky had died in 1881, Borodin six years later. Cui’s significance as a true member of The Five had always been open to question on grounds of both style and achievement, and he is often remembered now mainly for his notoriously destructive review of the first performance of Rachmaninov’s Symphony No 1 in St Petersburg in 1897 (conducted, ironically, by Glazunov in a questionable state of sobriety). Thus it was that Balakirev ostracized himself from what had been largely his own brainchild, and that Belaieff’s stewardship of the nationalist coterie in its next incarnation began to reconcile its aims with calm consolidation and a willingness to watch developments in Western Europe with interest. Glazunov had been taken by Belaieff to Weimar to meet Liszt in 1884, an encounter resulting in a performance there of the First Symphony which did more than anything to put the young composer ‘on the map’. He was to be described as an admirer of Liszt by Shostakovich decades later, preferring Liszt’s playing to that of Anton Rubinstein, even though he had by then dedicated his Symphony No 4 to the latter. To these observations we should add that Glazunov’s symphonic ancestry extends to Tchaikovsky, a composer whom it is easy to misinterpret as archetypally Russian simply on account of his importance in his lifetime and his durable reputation. 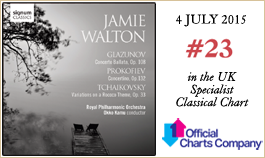 As Leslie Howard wrote in a perceptive essay on Glazunov [EMI Records Ltd, 1977], there is ‘a fairly narrow and generally balletic emotional frame of reference’ in his symphonies. Glazunov himself produced a number of actual ballet scores whose quality and vivid orchestral colouring place them very close to Tchaikovsky’s, and these find a natural extension in the intermezzo, scherzo or variation movements of his concert works. If the emotional climate of the more ambitious outer movements remains balletic, however, the rhetorical aims and effortless instinct for climactic pacing do strongly suggest Tchaikovsky the symphonist, not merely the ballet composer. A persuasive example is the first movement of Glazunov’s Symphony No 6 (1896), arguably his masterpiece and a work whose finale offers an exhilarating parallel to that of Symphony No 3 by Saint-Saëns (though without recourse to the organ). As Howard further notes, however, Glazunov’s date of birth both precluded too close an identification with Tchaikovsky’s symphonic output and also militated against association with the relatively progressive tendency represented by the mature Rachmaninov or the iconoclastic Scriabin. His compositional make-up was further compounded by interest in Wagner, to whom Liszt had introduced him. Moreover, Howard detects in Glazunov’s Symphony No 8 signs of Sibelian influence. In the face of all this he becomes a far harder man to pigeon-hole than might be anticipated—a fact which surely increases rather than diminishes him as a source of interest. While it would clearly be mistaken to distance him too emphatically from the nationalism of the Kuchka, its influence is only an ingredient in an idiom which offers more than the sum of its parts. 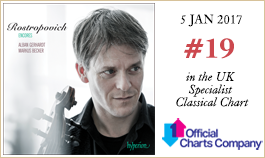 A substantial body of melodious and distinctive chamber music bears further witness to this. Élève-vedette de Rimski-Korsakov, Alexandre Glazounov s’imposa à son tour comme l’un des plus grands professeurs de composition de Russie. À la tête du Conservatoire de Saint-Pétersbourg de 1905 aux années 1920—y compris pendant la révolution de 1917, après laquelle ce fut le Conservatoire de Leningrad—, il compta parmi les premiers défenseurs de la musique de Chostakovitch, tout en demeurant personnellement ancré dans le style romantique «nationaliste russe» du siècle précédent. Il fut très prolifique (auteur, entre autres, de neuf symphonies, sept quatuors à cordes, trois ballets et deux concertos pour piano) mais c’est probablement son unique concerto pour violon qui résista le mieux à l’épreuve du temps, s’acquérant une place permanente dans le répertoire. Alexander Glasunow, der Starschüler seines Lehrers Rimskij-Korsakow, wurde seinerseits einer der bedeutendsten Kompositionslehrer in Russland. Er war von 1905 an bis in die 1920er Jahre Direktor des St. Petersburger bzw. nach der Revolution von 1917 Leningrader Konservatoriums. Schon früh förderte er Schostakowitsch, obgleich seine eigenen Kompositionen weiter im romantischen Russischen Nationalstil des vorigen Jahrhunderts wurzelten. Er war überaus produktiv (so komponierte er u. a. neun Sinfonien, sieben Streichquartette, drei Ballette und zwei Klavierkonzerte); doch hat sich wohl sein einziges Violinkonzert am besten gehalten und einen festen Platz im Repertoire erlangt.